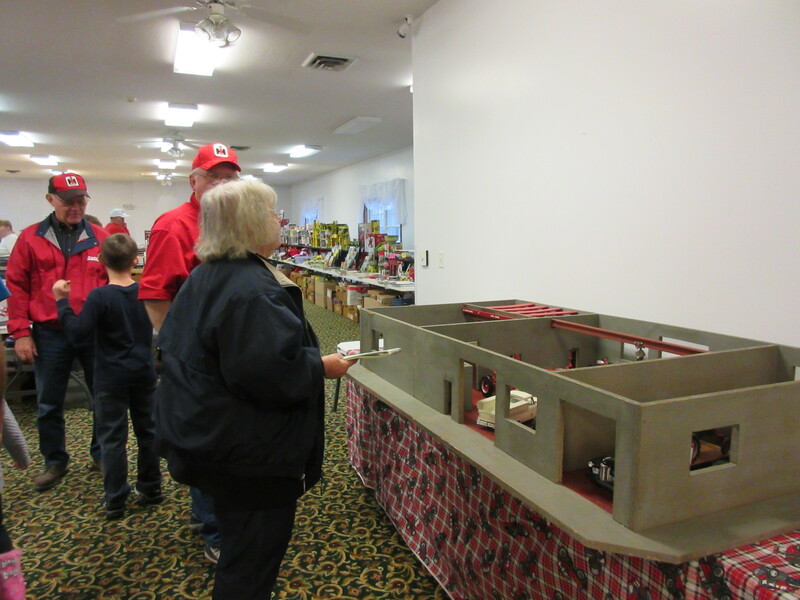 So, this past weekend we went to the small farm toy show at Carlyle, Illinois. The show is sponsored by the International Harvester Southern Illinois Club and is held at Mariner’s Village near Lake Carlyle. We have been attending this event that we think of as the kick off of the farm toy season. We met our friends the Elliotts who hail from Godfrey, Illinois, it was their first time at the Carlyle show. Jane Elliott had three things on her list to find, suspenders, a bright orange jacket for her grandson and a Half Century Calendar. She left with one, a calendar, and a new enjoyment of this before undiscovered show. There were several toy vendors set up, but for me the highlight of the show was a very cool display with a lot of history. David Thompson from Pinckneyville, Illinois had his farm layout of the Pinckneyville Equipment dealership. Dave’s grandson, Grant Thompson, helped him set up one last time. This show while the kick off of what Keith and I think of as the farm toy season was the last hurrah for this farm layout before it was installed at the Illinois Rural Heritage Museum, a very cool museum in Pinckneyville, Illinois. The dealership that has so many memories for Dave fits right into that mission. “I worked at the dealership in 1952. I started at 17,” Dave said. The Pinckneyville dealership was a block building that was built in the mid 30’s and was open through the mid 1970’s. “It was owned by J.O. Schemacher,” Dave said. The dealership is no longer there, it burned down so it remains only in this layout and perhaps in picture archives. Dave took his memories and built this display about 20 years ago adding touches as recently as this past Thanksgiving. An avid collector, Dave owns about 150 toys and has set up for years at the Thresherman’s show and at the Carlinville Toy Show. These days Dave would rather be driving his Cub Cadet around and letting visitors at the museum view the display. It was cold, but attendance was good and many of the toy folks were out and about sharing what they love the most a bit of chatter about their favorite hobby!